To get evidence about this, we started with a set of forecasts of growth in the second quarter of this year that were made last November — after the crisis had hit, but before countries had formulated their policy response. We then collected analysts’ recent best guesses for what second-quarter growth will be in those countries. This figure shows the relationship between how countries’ second-quarter growth prospects have changed from what was expected back in November, and the countries’ discretionary fiscal stimulus in 2009. 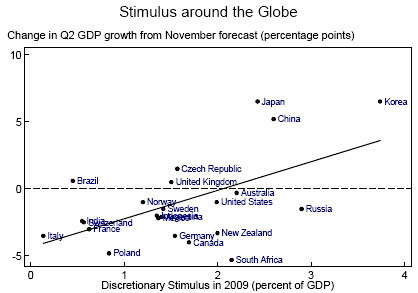 The fact that the observations lie along an upward-sloping line shows that, on average, things have improved more in countries that adopted bigger stimulus packages. And, the relationship is sizable: on average, a country with stimulus that’s larger by 1% of GDP has expected real GDP growth in the second quarter that’s about 2 percentage points higher relative to the November forecast. Italics mine. This is, obviously, hardly ironclad proof about how well fiscal stimulus works. For one thing it’s based on estimates, not final data, and if those November forecasts were systematically overoptimistic they might also have been systematically useless. What’s more, eyeballing that line doesn’t suggest to me that Romer’s correlation is very strong — especially since it mostly seems to rely on three Asian outliers. Still, it’s up and to the right, and that’s a data point in favor of using fiscal stimulus during an economic crisis. There’s more evidence in the talk too, all of which is suggestive though not conclusive. Of course, you wouldn’t expect anything conclusive at this point. Overall, though, I expect data from 2008-2011 to become a rich field for economists to study in the future. We haven’t had a worldwide recession like this since the Great Depression, and it presents a unique opportunity to study what worked and what didn’t. There are enough variables that drawing firm conclusions will always be hard, but it’s nonetheless the best chance we’ve had in decades to get meaningful comparative data on macroeconomic policy responses to an economic crisis. This paper is a start.